These are so soft and delicious. They are not low-calorie, but they are a yummy treat. If you have a Kitchen-Aid mixer with the dough hook attachment, they work lovely. If not, you can use a food processor to combine everything together. You'll need to knead (haha!) the dough if you are using the food processor. Only don't knead with flour, use vegetable oil. In the mixing bowl on your Kitchen-Aid or the bowl on your food processor, mix milk, water, butter, eggs, vanilla and sugar. Now add flour, salt and yeast. Mix until a ball forms. In the Kitchen-Aid, keep mixing for about 2-3 minutes. Remove the dough ball from your food processor bowl and pour onto an oiled surface. Knead for about 2-3 minutes. Roll the mixture onto an oiled surface, press into a 15 x 24 rectangle. In a bowl, combine brown sugar and cinnamon. I usually rub the mixture through my fingers to make sure it's completely combined. It will feel like dry sand. Pour melted butter over the cinnamon roll dough rectangle and then sprinkle the brown sugar and cinnamon mixture evenly over it. Spread it to the edges, making sure it soaks up the melted butter. Roll up the dough and then slice into equal portions. I make 12 rolls. Cut the dough log in half. Then cut each half into half. You should have 4 smaller logs. Now slice those into 3 equal slices. You can freeze them at this point. If you want to bake them, place into a baking dish, cover with plastic wrap and allow to rise for 1-1.5 hours. Bake at 350 degrees F for only 10 minutes. In a bowl, mix and stir everything together until smooth and creamy. 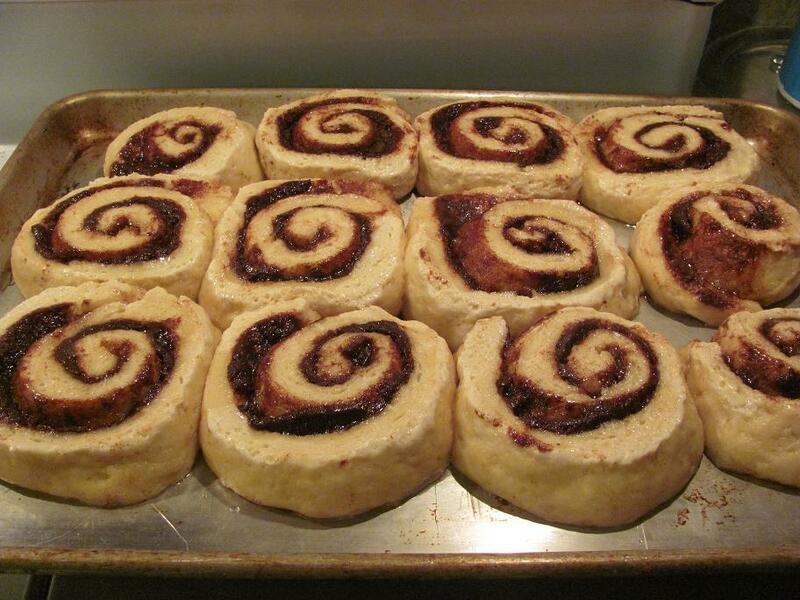 Immediately spread onto each cinnamon bun hot out of the oven. Melt butter in skillet, add brown sugar. Bring to a boil add corn syrup and apples. Cook for another minute or two, stirring to coat the apples and making sure everything is melting nicely. Line a 9" cake pan with tin foil and then place a 9" circle of parchment in the bottom. Then pour the caramel apple mixture into the bottom. Arrange cinnamon rolls over the apple mixture and allow rolls to rise for an hour or so. Bake at 350 degrees for 20-25 minutes or until golden brown. When you press on the center of the rolls, it should sink a little. That's good. 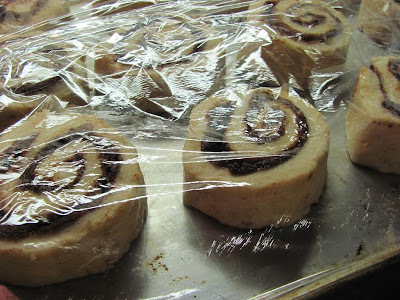 Flip them onto a serving plate and then peel the tin foil away and parchment circle. 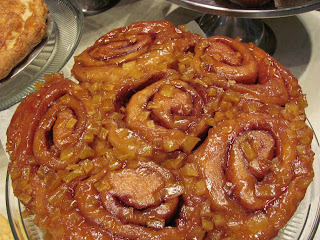 *I've also made these with pears. They are so yummy and gooey! Oh lawsy. Caleb makes the pioneer woman's recipe and they are paradise in yer mouth. Ha! 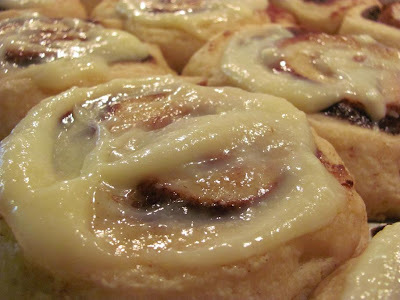 Oh great, now you have me craving cinnamon rolls! ;-) Seriously, these look delicious! !